Southern Illinois University Edwardsville hosted its third annual eHacks event March 2-4 at the T-REX Innovation Center in St. Louis. 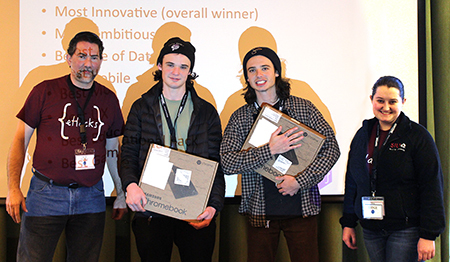 A pair of brothers from Maryville proved victorious in the invention competition, earning the Most Innovative award for their creation of Art Drop, a mobile graffiti app. The annual hackathon was hosted by the SIUE School of Engineering’s (SOE) Department of Computer Science and sponsored by area technology companies. The event challenged approximately 90 collegiate participants, comprising 24 teams, to build something new with software and computer hardware. Participating students from SIUE, the University of Missouri-St. Louis, Washington University, Principia and other bi-state colleges worked for 36 hours during the event to produce their projects. Along with the top prize, six other awards were presented, including most ambitious, best user experience, best use of data, best educational application, best mobile application and best game. Engineers and recruiters from St. Louis’s leading tech companies served as judges. Eight SIUE computer science students, along with Bouvier, invested weeks in event planning and preparation. The students included Meghan Heisler, Taylor Dowdy, Jared Schooley, Justin Bruce, Eli Ball, Zane Norris, Jacob Novosad and Zach Anderson. For more information on the event, and its sponsors, visit ehacks.cs.siue.edu. Photos: (L-R) Maryville’s Reiser brothers took home the Most Innovative award during SIUE’s third annual eHacks event. Standing on their left and right are SIUE organizers Dennis Bouvier, PhD, associate professor of computer science, and Meg Heisler, a senior studying computer science. SIUE eHacks organizers (L-R) included Jared Schooley, Justin Bruce, Dr. Dennis Bouvier, Taylor Dowdy, Eli Ball, Zane Norris, Jacob Novosad and Meg Heisler. Zach Anderson is not pictured.